Here we are in Late August, approaching the cool mornings of September and all the great fishing that comes with it. Summer fishing has remained strong. It’s not uncommon to have good fishing into Mid or Late July then it seem to really die off until late August or early September. Make no mistake about it, it’s due to fishing pressure. After all the guide boats and independently owned drift boats float the same sections of river, the fishing dies until the traffic dies. Welcome to the new normal. One of the best ways to combat this is to find the small streams that drift boats can’t float. You will notice the difference in the fishing just by avoiding the main beats. That has been the key for me to stay on good fishing for my clients through the summer. Cool nights will improve the fishing as the water temps start tickling the upper 50’s. My favorite time of year to streamer fish is September until mid October which is typically when the brown trout start spawning. You move more fish and have potential at big fish also. It’s not uncommon to see 50 to 75 fish come to the fly in a day before the water temps start to dip in mid to late October. 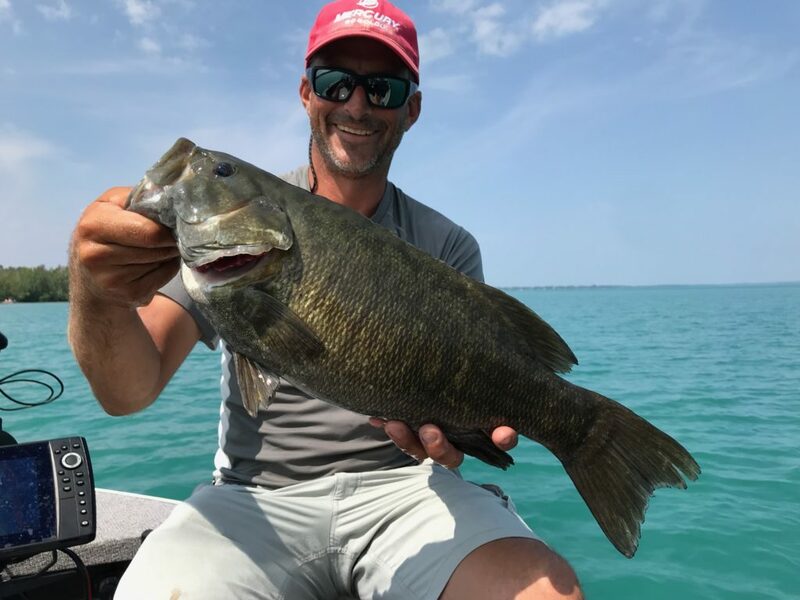 Peak streamer fishing is typically when water temps are in the 50’s and the temp drops into the 40’s less fish are active but big fish will still come out and play. September through mid October is probably the best time of the year to get someone started in streamer fishing. 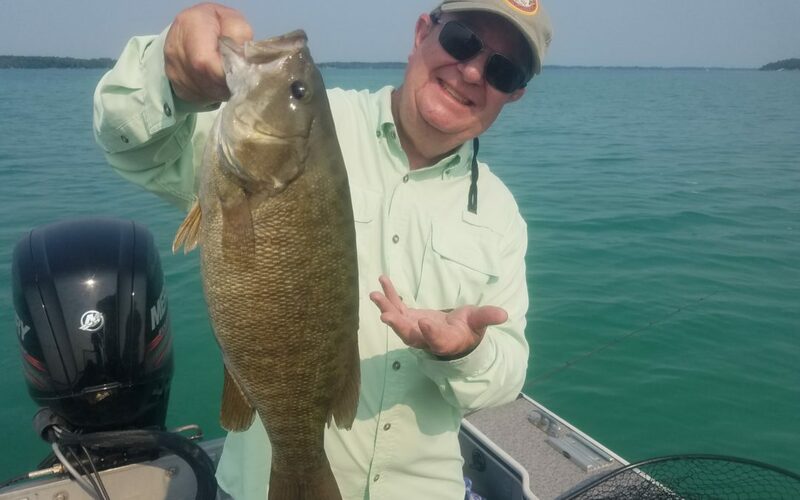 The action can be fast which gives clients time to practice hook sets, get accustom to seeing fish follow and practice teasing fish to make them bite. That will pay dividends when a big fish shows up down the road. 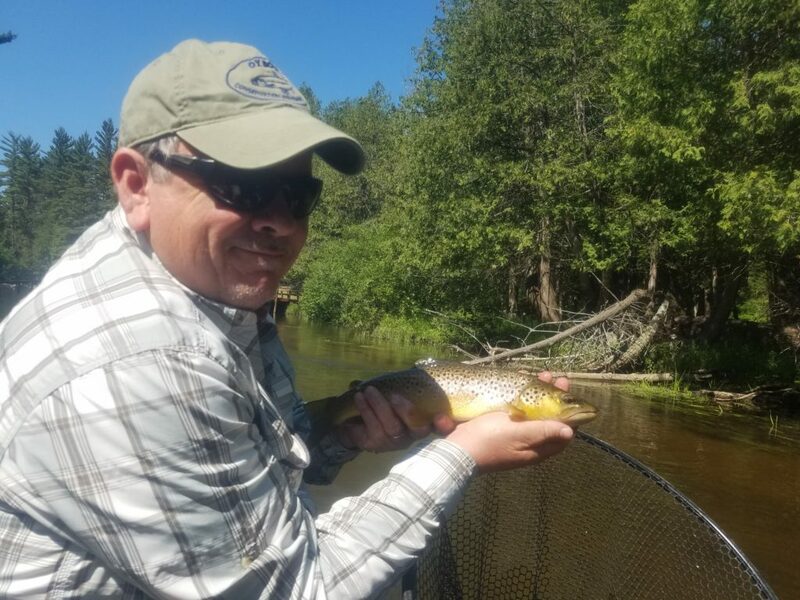 Between the Boardman River, Manistee River and the Au Sable River there is usually a place to find active fish. Speaking of the Boardman, there is just one more month before it closes for the season. It is an experience very different from most of the rivers in Michigan. It is a stream that is just big enough to comfortably fish out of the Flycraft and has more gradient than most of the rivers in the state. Fast riffles, hard inside bends, deep pools, grassy undercut banks and wood…there is always a target. Most people assume that since it’s close to Traverse City that it’s like fishing in a back yard, that is not the case. There are still large portions of land with no houses, more the Manistee River than the Holy waters. 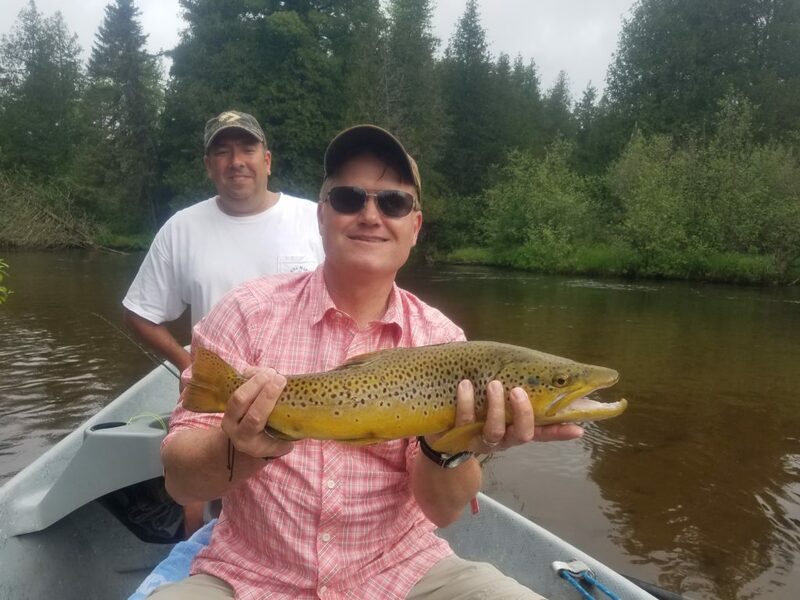 The Boardman runs cold all year and has a good population of quality brown trout and piles smaller brown and brook trout. 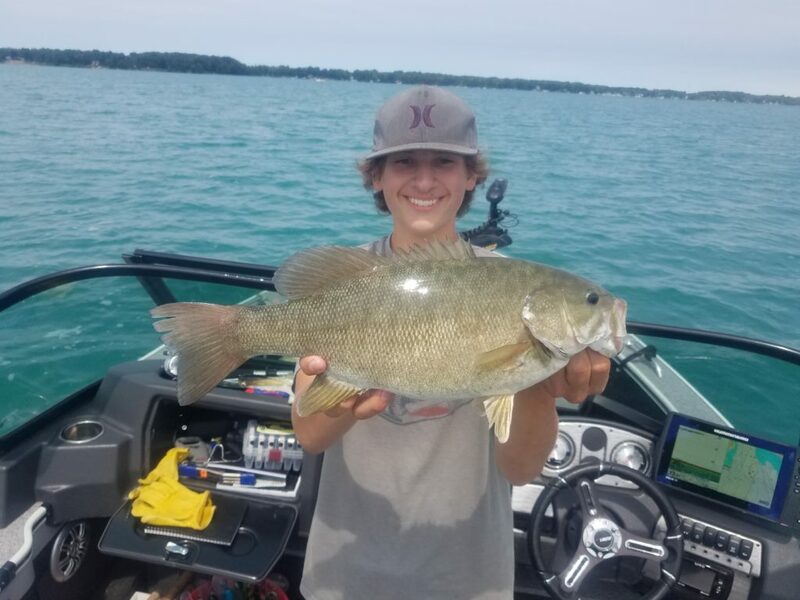 On the inland lakes the bass have been in 20 to 40 feet of water with smaller fish in 10 to 15 feet. In this situation drop shot rigs on light spinning rods and 3/4oz jigs with craw trailers have done the trick. I typically have both rods rigged and ready to go and will fan cast large flats to search out fish with the 3/4 oz jig. When I mark a fish on the sonar I send the drop shot down. Most days the fish are split between the methods, which makes having both rods ready imperative. The next few weeks should really crank the bass fishing up. The spinnerbait bite is just around the corner and the fish will be up shallow enough, to once again, target the bigger bass on flies. When loading up the fly rods to bass fish I typically carry 3 rods rigged and ready to go. I prefer 9 weights due to the wind encountered on larger bodies of water and the larger flies the big bass prefer. I have 3 9 weights on board, one with a floating line, a sink tip on another and an intermediate line on the 3rd. I tend to fish the intermediate line most frequently because it allows you to pause large flies without them crashing to the bottom. I use the sink tip for fast retrieves like the two hand burn, which can be very effective when fish are on the spinnerbait bite. The floating line is always ready to go as the bass will be pushing minnows to the surface once the water temps cool a bit, and you never want to miss a topwater bite. 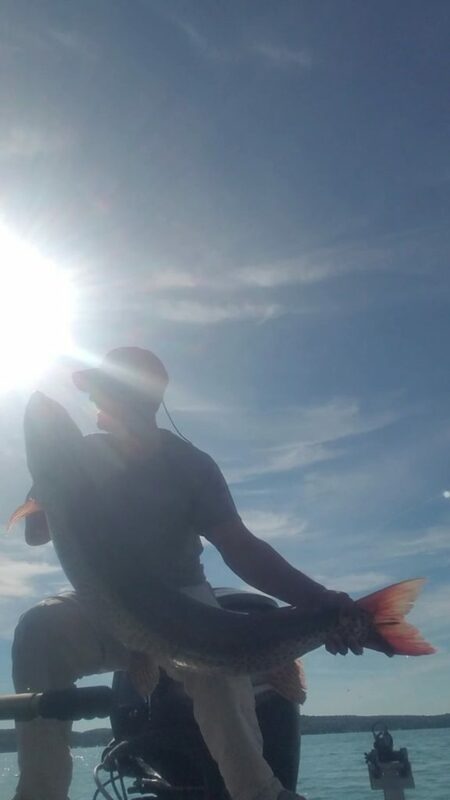 Musky fishing in my area is never good, but I love it. It’s been slow last month on the musky hunt but we are coming into the peak season, fall. Late June to Mid July was better for me and I was able to locate and catch a few nice fish. Both were caught trolling. September into October usually produces some of the best musky fishing of the year. Casting once again will become a good option as the lakes start to cool. I’ve been gathering Dadson Blade Baits and a bunch of plastics in anticipation for the fall. With the new regulations on the chain there should be an increase in population on the way. A minimum size limit of 50 inches was adopted on the lower chain and the upper chain moved to 46 inches. 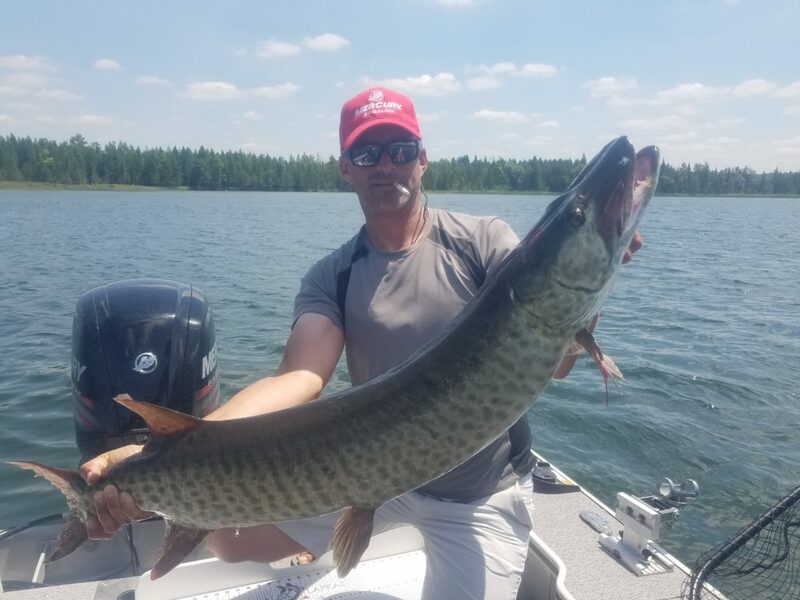 It makes more sense for the whole thing to be 50 inches but the State of Michigan doesn’t have any data on the musky populations for the upper chain, which shouldn’t be surprising. The good news is that they are doing some studies now to understand that fishery better. It’s going to be a busy fall, September through Mid October is my favorite time to fish. All the fall spawning fish get aggressive and start to think about it before the process, prespawn. The spring spawning fish are loading up to get through winter. Many of the largest fish I have caught have come in this time frame. 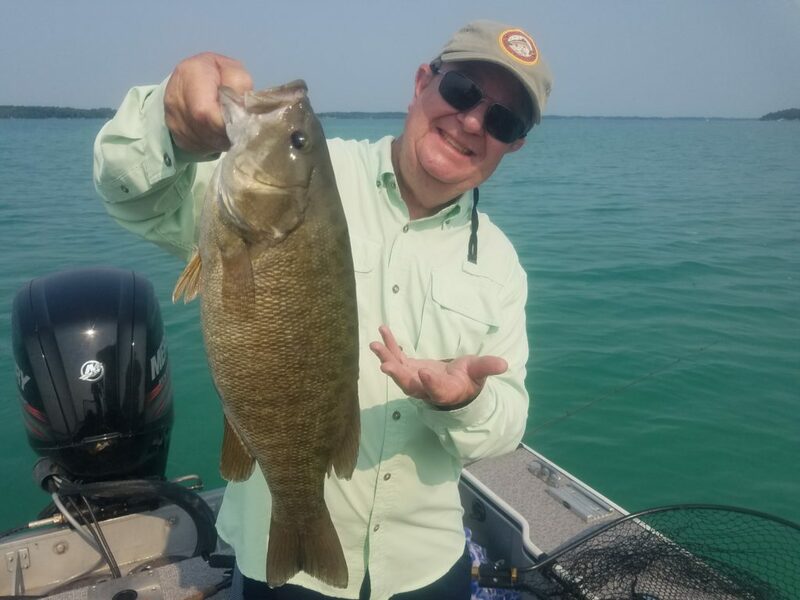 From upper 20 inch Michigan brown trout, to 6 pound smallmouth and musky’s that top 40 pounds, the big fish come out now! Once the water temps start to fall in late October the fishing gets harder as the metabolism slows and the lakes return to gin clear. The brown trout spawn also starts around then and I usually try to let them rest until November when the majority of fish are in the post spawn stage.